A beautiful stretch of land lay between Florence and Beaver Lick. Many homesteads had already been built within a two mile radius, and the neighborly minded people felt it should be called a settlement. Old documents such as diaries, deeds, and geneology reports show that Union existed as a settlement, of a sort, within a two or three mile radius many years ago. The old stone house one mile north of Union on Highway 42 was built by slaves. It has been listed as a historical structure in Kentucky for some time. It was originally built by the Fowler Family. In one of the diaries the writer tells of coming to Union from her home and spending over $100 for needed necessities, which the general store carried. She also tells of her anger toward the Union soldiers who had set up camp in her church of Old Sardis, and then asking God to forgive her for her evil thoughts. It has been recorded that Union was incorporated in 1871, but minutes show that Union was organized as a city as early as 1854. City officers were elected and served for the betterment of the roads, businesses, and convenience of the residents. Rigid laws were made and enforced. Sabbath rules were very important an the religious minded citizens wre protected against any disturbances on that day. UNION! Why was it named Union? The only explanation known is that it became a conncetion point between Florence and the already famous Big Bone Lick. The sulphur springs, bountiful supplies of salt and the excavation of massive bones of prehistoric animals, had become quite an attraction. The sulphur spring water was proven to be healthful for drinking and bathing. The "Henry Clay" hotel was busy, accommodating the many attracted vacationers. Many came down the Ohio River, landed at the closest point and were taxied by horse drawn carriages or rigs to Big Bone Lick. Salt was manufactured there before 1812 by the Indians and the whites. It was brought to Union and picked up by members of other settlements. A post office was in operation by 1850, and a bank in 1905. James L. Frazier, grandson of an early settler became the first banker. He later marrled the teacher on the White Haven private academy, (located two miles south of Union on what is now U. S. 42) Nannie D. Bristow. The hotel called "The Eagle" was owned and operated by "Uncle Lon" and "Aunt Lib" Voshell. The Millinery shop, supplying the hats and gloves for the ladies, was located in a small building on a lot next to the post office, and the Presbyterian church was built next to it in 1870. A large general store of two stories was located on the corner of Mt. Zion Rd. and was owned and operated by Mr. Clements. The second floor was used by the "Grange" for a meeting place. The frame building burned and was replaced by the brick building still standing. The store was later owned and operated by W. M. Rachal and Ben Norman until their retirement. A cobbler kept busy making new shoes and mending the old ones. The drugstore on the corner opposite the general store, supplied the medicines needed by the two doctors, Dr. Blanton and Dr. Lassing. Memories of these two men have been handed down through the years, for their untiring services ministering to the people's needs. Calls were made day and night by buggy or horseback over mud roads, in all kinds of weather. A village blacksmith had located around the corner from the bank. One could hear the bellowing and ringing sounds, as the smithy worked keeping the wheels turning and the horses shod. The creamery, operated by Mr. Mollett, was a flourishing business, in the area that is now the home of Johnye Ligon. The bubbling springs of bountiful icy water (still flowing) was used for the operation. Two toll houses, one on the north end and one on the south, each a mile from the center of Union, (still standing) collected tolls that helped maintain the pike and the city board walks. A Hard Shell Baptist Church, "Sardis," was built in the 1850's, past the hotel, across Fowler Creek. Old Gunpowder Church was organized in 1851 on Pleasant Valley Road. Big Bone Baptist Church, organized in 1843, located near the Big Bone Springs, was a flourishing church and many of the Union citizens were members there, because they were agreed with their mode of worship and religious beliefs. Horses were hitched, each day of worship, to buggies and surreys, and some rode horseback to attend services at Big Bone Church. By the year 1886, those living in Union realized a need for a meeting house in Union. The long cold winter months prevented some from attending services for many weeks. A petition of 35 names, was presented to Big Bone Church, December 1886, asking for dismissal from Big Bone to organize a church in Union. With tears of sadness the petition was granted. Land that had been purchased by Big Bone earlier, was now deeded to Union to erect their meeting house of worship. Adjoining land was donated by the J. W. Conners, the B. L. Rices and Mrs. Rachel Rice for the purpose of parking their conveyances. 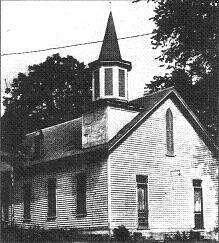 Thus Union Baptist became a church of 32 members, January 1887, determined to serve the Lord and be a lighthouse in this community of Union. Four men of high spiritual caliber and excellent leadership were chosen as deacons: C. T. Rice, James A. Huey, J. W. Conner and William Adams. On March 2, 1887 Bro. Lafayette Johnson accepted the pastorate. Bro. R. E. Kirtley and James A. Kirtley, of Bullitsburg Baptist Church moderated the early meetings. The records show a great first year, adding many to the membership by letter and by statement. Emma Riley, mother of Opha Bristow, was the first addition for baptism. The baptismal pool was in Fowler Creek at Old Sardis Church. In the Fall if 1887, Frogtown Grange Hall (Excelsior) near Lexington Pike was secured as a mission field for preaching. Union Baptist Church paid for repairs on the building. In September 1887 Union Baptist was received into the North Bend Association. The ladies of the church soon saw the need of helping the church to grow, so banding together they organized their women's group, which turned out to be the first Women's Missonary Society in the Association. They made quilts, beautiful crochet and tatting, tithed their egg money, and had socials which strengthened their fellowship greatly. Through their efforts the pulpit furniture was purchased. Presently, the chairs are being used in the ladies lounge. They were saddened by the death of one their dear members, Mrs. C. T. Rice, October 1887, at age 58, (Wife of C. T. Rice, one of the deacons). Bro. Johnson served acceptably for almost five years. G. W. Hill pastored for eight months then Bro. Johnson served again for eight months. Sam. M. Adams became pastor in 1895 and served until December 1904. In September 1901 the envelope plan was started to raise money for missions. In April 1902 it was agreed to extend an arm of support to Old Gunpowder Church in Sunday School and preaching services. J. Sam Wilson was pastor from December 1904 to August 1907. J. T. Stewart served from April 1908 to September 1908. Bro Steward later went as a missionary to Rome. Marshall Calvin Frazer was pastor from October 1908 to August 1909. G. B. Reed was licensed to preach by the church and remained as pastor from January 1910 to May 1912. Union began to use students from Louisville Baptist Seminary as pastors. J. M. Balentine and John C. Taylor served in turn from June 1913 to October 1915.